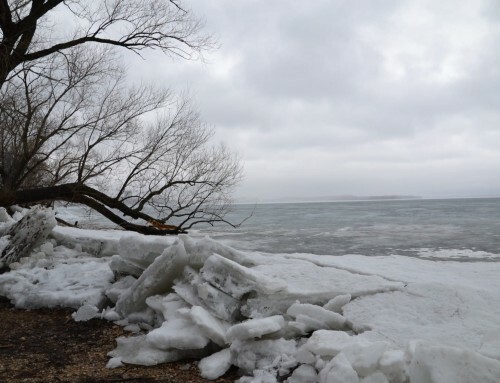 January on Lake Winnebago has been a story of polar opposites. An unseasonably warm start to the month left the lake with large pockets of open water and very inconsistent ice, where formed. As we head into the final week of January, the coldest air temperatures of the century are forecasted. A significant snowfall impacted the region last week, and another massive storm is expected on Monday bringing nearly a foot of new snow to the region. Unfortunately, an area angler died when their ATV broke thru a thin pocket of ice on Jan 21st near North Fond du Lac. The angler was veteran of the system and understood the lake dynamics very well and will be missed by his family, friends and the outdoor community. 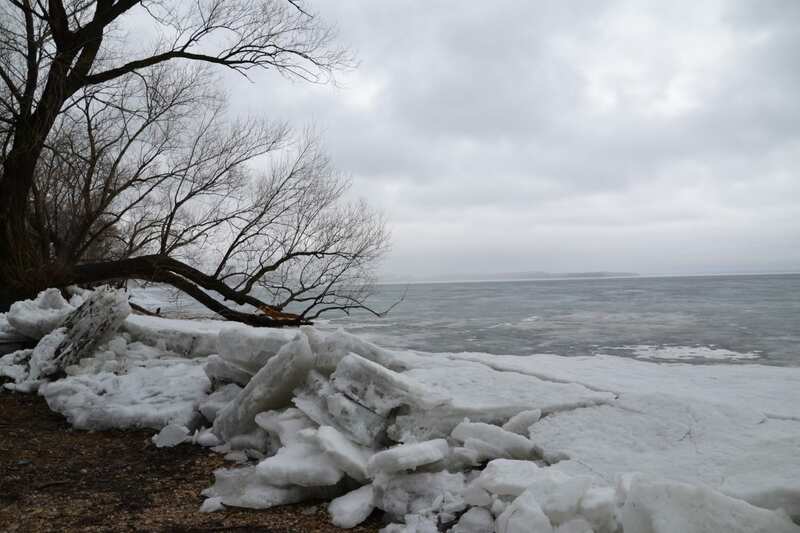 The last week has done a lot to solidify the ice on Lake Winnebago and Lake Poygan. In general, ice depths have surpassed suggested levels were ATV’s and snowmobiles can now access the main lake. As of Sunday, tree lines were being established at some locations. Regardless of these developments, every angler needs to make individual judgments as to their safety. While the cold is a positive to the system, when temperatures get to extreme levels (like this coming week), the ice can fracture and can create unexpected challenges. With the extreme cold, only a few anglers were out on the ice this weekend, so there is little to report by location. 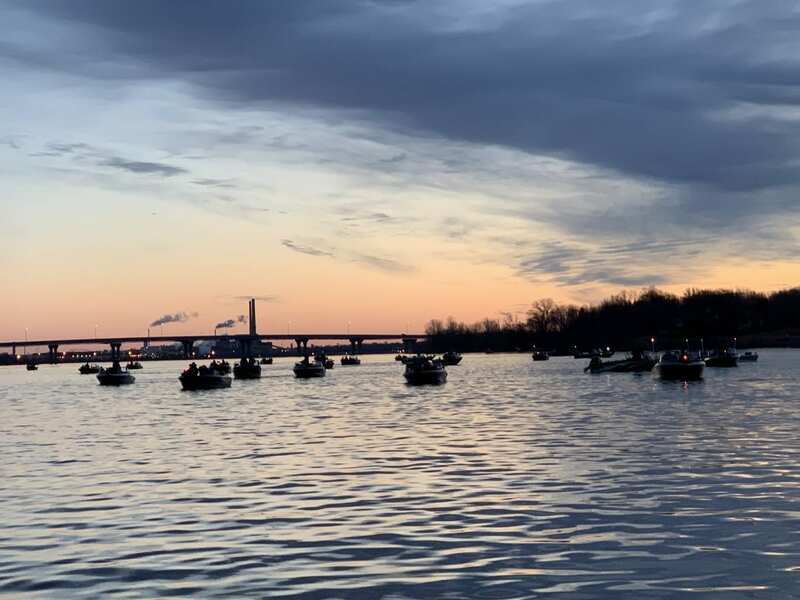 Anglers have had limited access to Lake Winnebago until recently, so targeting white bass, crappies and walleyes in the mud has not been possible. The perch bite has been solid all season on the reachable portions of the main lake and back bays. 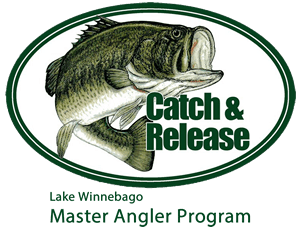 The 2018 trawling report for Lake Winnebago was released this week. The trawling report is a Fall census done by the WI-DNR to measure fish populations, growth rates, and exploitation. The population of yellow perch is the highest level since 2011, per the sample. Additionally, the 2018-year class of perch was at a seven-year peak. Ultimately, because the perch have been shallow (under 12 feet) and are strong in numbers – they have been the primary target of fishermen. Small spoons, tungsten jigs, and raps have all been productive. Red spikes and minnow heads are key meat choices and are essential to catch rates. Red worms have been found to be numerous this winter in the mud (hence the preference towards red spikes). This becomes critical information for sturgeon spearing in two weeks, as it is possible the sturgeon will be associated with the redworm pockets and likely at the bottom of the water column. The 2018 shad hatch was the worst since 1998 and among the lowest on record. Walleye catch rates have been slow, mainly related to poor access to key locations. 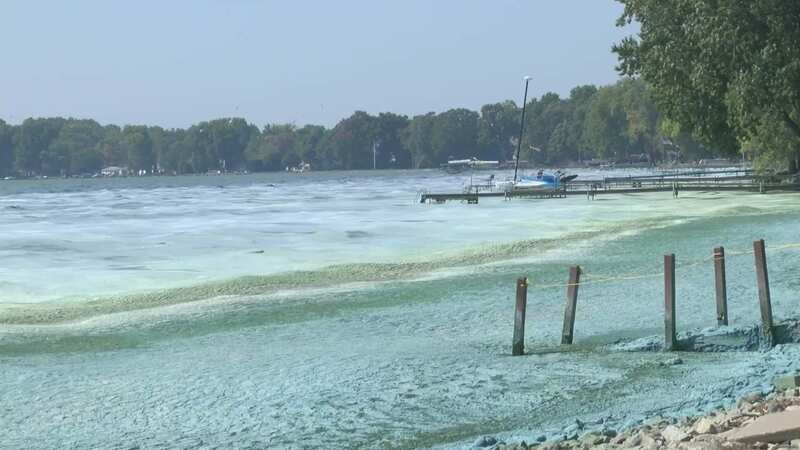 Once access to deeper water becomes available, the bite should be pretty good through early 2019. Sunday 1/27/19: 10 to 19 inches of ice was registered by the Pipe Fishing club off Columbia Park on the east shore; with an average of 13 inches out to the 4-mile marker. Many anglers are focused on the area at 2-3 miles out from the access point. 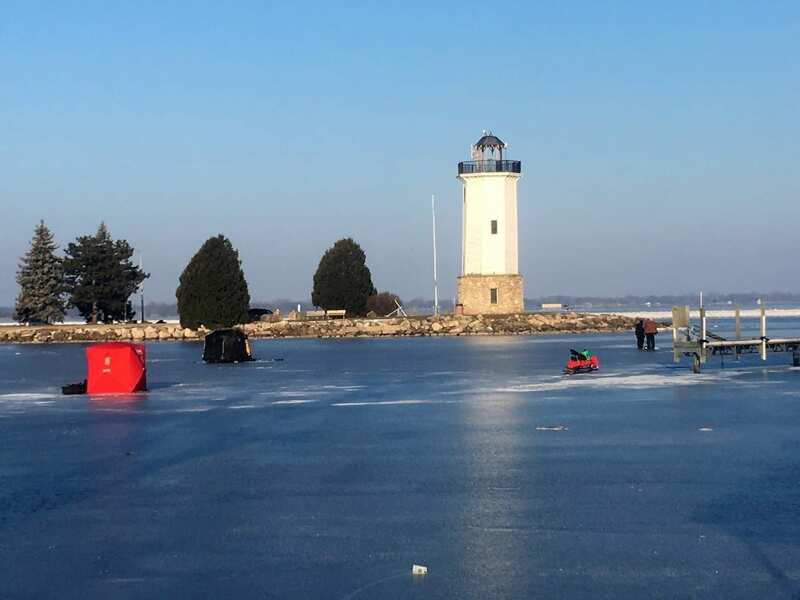 Sunday 1/27/19: Reports at the Fisherman’s Road launch indicated 11-15 inches of ice in the general area. Trucks are driving out, but no tree line is in place — solid angler activity about 1-1.5 miles out of the launch. Saturday 1/26/19: Lake Poygan has reports of 8-14” of ice according to Noffke’s bait. Beware going west out of Noffke’s landing as thin ice is present. Saturday 1/26/19: Out of Merritt Street in Oshkosh, the ice is estimated at 14” at about a quarter mile out, and 10” beyond a mile out. There are several working cracks between the shoreline and the 3-mile marker. Four-wheeler bridges have been placed for use per Sunk, Dive Service. 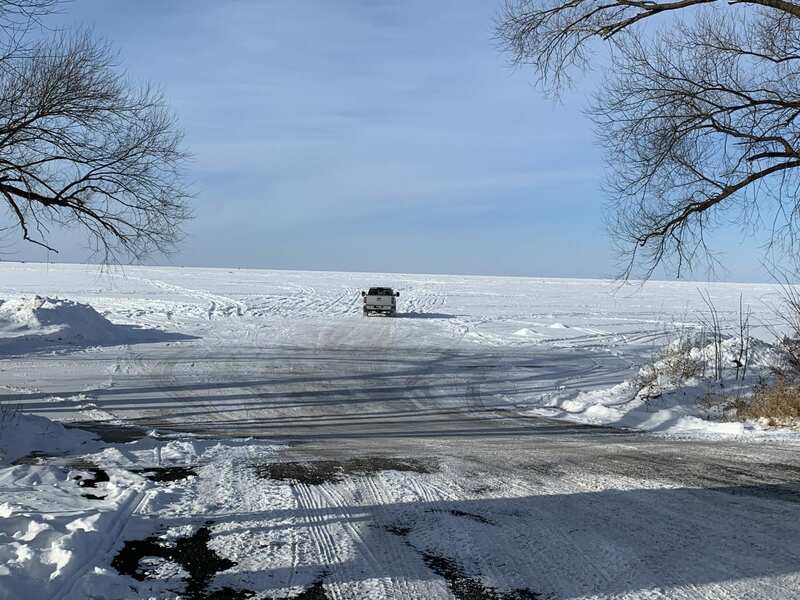 Saturday 1/26/19: At Brothertown, WI 11-14” of ice was present and the tree line was expected to be placed on Saturday, per the Brothertown Fishing Club. Wednesday 1/23/19: The Quinney Fishing Club indicated the four-wheeler bridges were to be placed. There is a working crack about .2th of a mile from the access point. Other notes: There is significant snow cover on the surface of the ice, so plan accordingly should you get stuck. There are no plowed roads (except Pipe), as plow trucks have not been on the ice yet. With the pending snowstorm, expected travel conditions to be difficult for the foreseeable future. The annual “Party on Poygan” fishing competition occurred 1/26/19. First place was Ryan Ulrich with a walleye weighing in at 6.8 pounds. 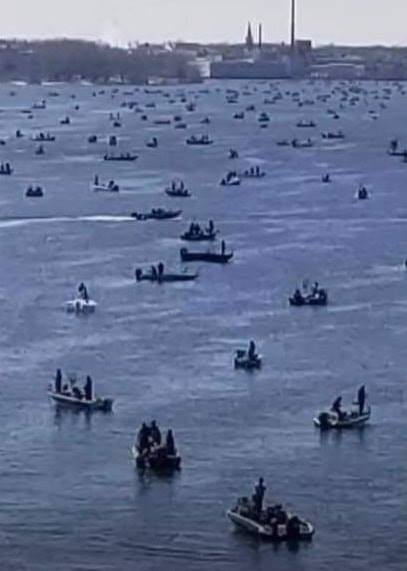 705 tickets were sold for the event, and better than 200 fish were registered. More reports to come! Stay on top, and remember the ice is never 100% safe.